SOLD A New Map Of India & China From the latest Observations. Title: 'A New Map Of India & China From the latest Observations. By: I. Senex. To the Honorable the Directors of the East India Company, this map is humbly inscribed. '. 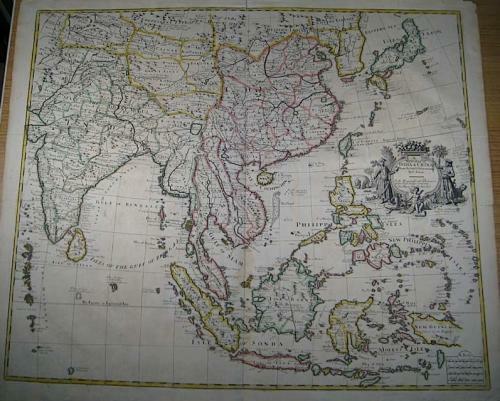 A very desireable map of the East Indes, getting very scarce. The map features greater detail due to increased geographical knowledge of India derived from the English East India Company, which was fervently competing with the French for predominance in the region. Similarly, such information on coastal China, Japan, Indonesia and Malaysia came from the Dutch, who still dominated trade from these lands while the inland details of these nations was primarily derived from the missionary efforts of the Jesuits. Relief is shown pictorially. Some small repairs in the margins but overall very good.